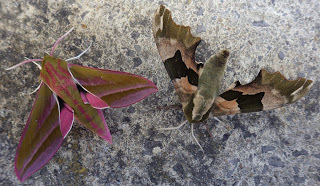 The weather this week - sadly now reverted to the norm - was exceptional for moth trapping, reminding me of the classic prolonged hot summer of 2006, a year of migrants, wandering/dispersing moths and good records generally. 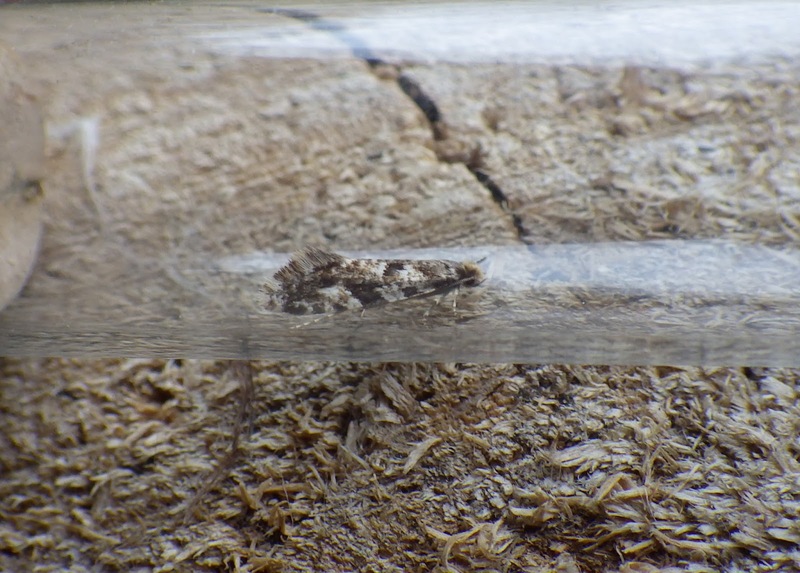 I trapped on Tuesday to Thursday inclusive but, given Chris Handoll`s superb pair of records at his home trap site in north Carmarthenshire, I now wish that I`d trapped on Friday night too! My best night was on Thursday, when two traps at my Pwll garden (one MV and the other a mains actinic) yielded 103 species of moth (with at least a further two micros to determine), my best result at this site. I have the advantage of living on the coast with surrounding coastal, wetland and woodland habitats supplementing a nectar-rich garden, which partially accounts for the good `score`. 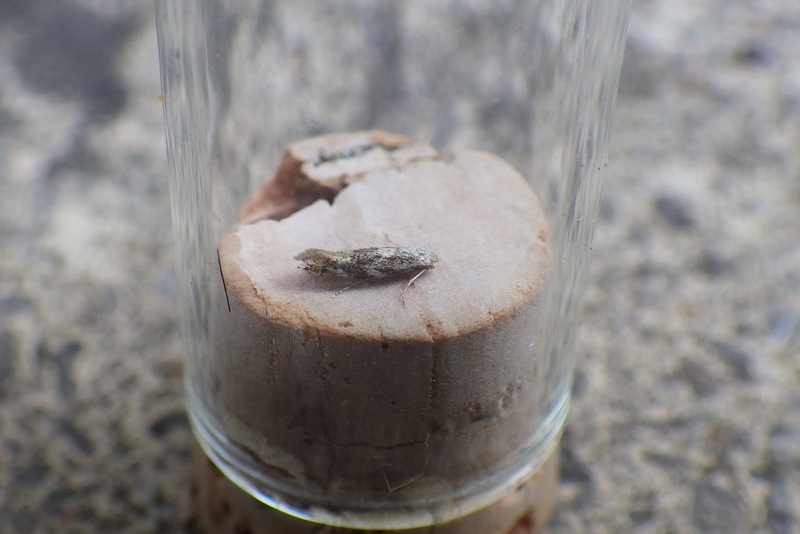 Many moths, of course, were `regulars` (albeit in really good numbers) with a sprinkling of `goodies` such as lime hawk-moth, orange footman (this moth is having a good year with me), common lutestring (not `common` with me), dark sword-grass (the only migrant), Dioryctia abietella, Nemapogon cloacella (from memory, new for me), Mompha substrigella and two species of conifer-colonist Argyresthia - cupressella (also having a good year) and trifasciata. 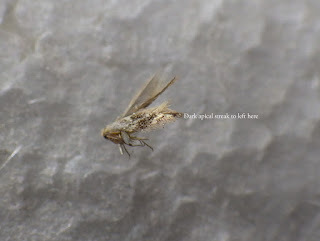 One micro constitutes a NCR - Bucculatrix albedinella, awaiting Sam`s confirmation. It has already been checked to see whether it`s the very similar B. bechsteinella, which lacks the apical stripe on the wings. My individual has the latter feature. 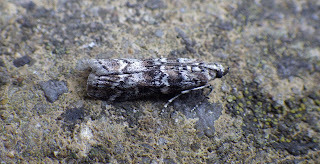 B. albedinella is feeder on field elms (the Ulmus procera/minor group) which certainly grow only metres from my garden trap site. Incidentally, these elms also are believed to support my regular lime hawk-moths and the colourful pyralid Rhodophaea formosa, the latter at its sole, if regular, vice-county site. Above: a lime hawk-moth, with an elephant hawk-moth for size comparison. I had a different, much tattier individual on the previous night. Above: Dioryctia abietella. I`ve also had the larger sylvestrella once in the past. Above: the `cork moth` Nemapogon cloacella, new for me. Above: Bucculatrix albedinella. 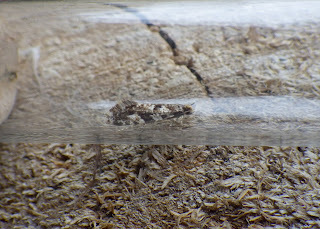 The black apical streak is not visible in this photo, but could be seen when the moth moved around the glass tube with its wings partially open. The specimen has been retained and the streak is similarly visible on the now-dead specimen. Field elms also occur elsewhere along the low-lying coast of SE Carmarthenshire and in Glamorgan on similar land around the Burry Inlet. This species is known from Mons vc35, but not Glamorgan - the same applying to Rhodophaea formosa - perhaps beating/sweeping/trapping of that area might bring dividends for vc41? I suggest the Loughor-Gowerton-Penclawdd coast. Above: the (poorly) pinned B. albedinella, with the dark apical streak visible to the left of the white text in the badly-posed photo. Click on pic to enlarge. It is much clearer with the specimen `in the flesh` in front of you. 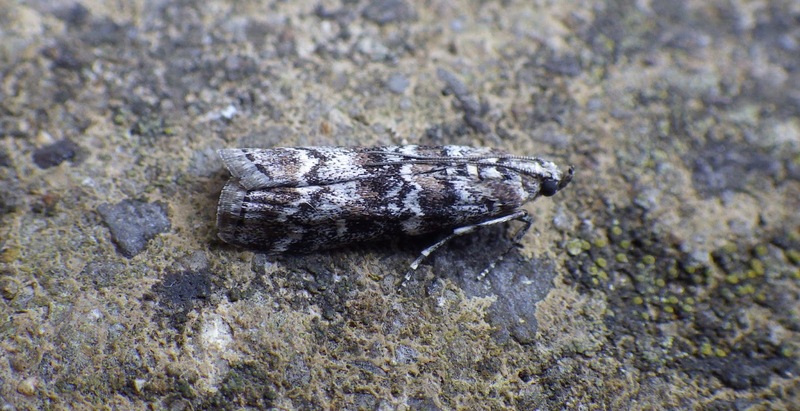 Bucculatrix albedinella is a good record, and given weather conditions it's hard to know whether it is resident in the Pwll area (it's quite easy to overlook) or a wanderer. I have found it twice in VC35 - once last year as a mine and once as an adult in 1999, and the latter was on my regularly-trapped Dingestow site (where I have never found it subsequently so it's definitely easy to overlook); there is one previous Emmet record from VC35. Thanks Sam. I may try sweeping of the frequent hedgerow elms around WWT Penclacwydd if I get a chance in the next week or so, and look for mines later.